Hope everyone's New Year is going well. We enjoyed the start of ours with family. Little bit of Just Dance and Rockband on the Wii. Little bit of wine and snacks. Lots of laughs and fun. It was really nice having my parents visit for a few weeks right around the holidays... although with all the snow we've had they have vowed not to come at that time again. 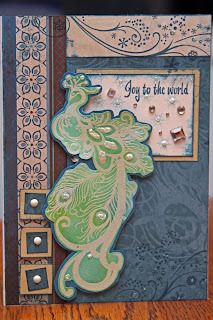 Working on some projects ... for now here is a card I made last month.